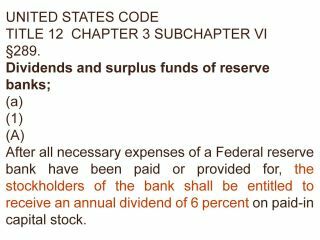 Today I learned that, unlike people or other corporations, Federal reserve bank stockholders don't have to pay federal, state,or local taxes on their annual, fixed dividends of 6% on capital stock (which they ironically call "entitlements"). They only pay property taxes on their buildings. Of course, the rest of us pay regular income tax rates on dividends. Go figure. After all necessary expenses of a Federal reserve bank have been paid or provided for, the stockholders of the bank shall be entitled to receive an annual dividend of 6 percent on paid-in capital stock. The entitlement to dividends under subparagraph (A) shall be cumulative. (c) Federal reserve banks, including the capital stock and surplus therein, and the income derived therefrom shall be exempt from Federal, State, and local taxation, except taxes upon real estate.